Graphic Recording Case Study - Your stories. Our drawings. 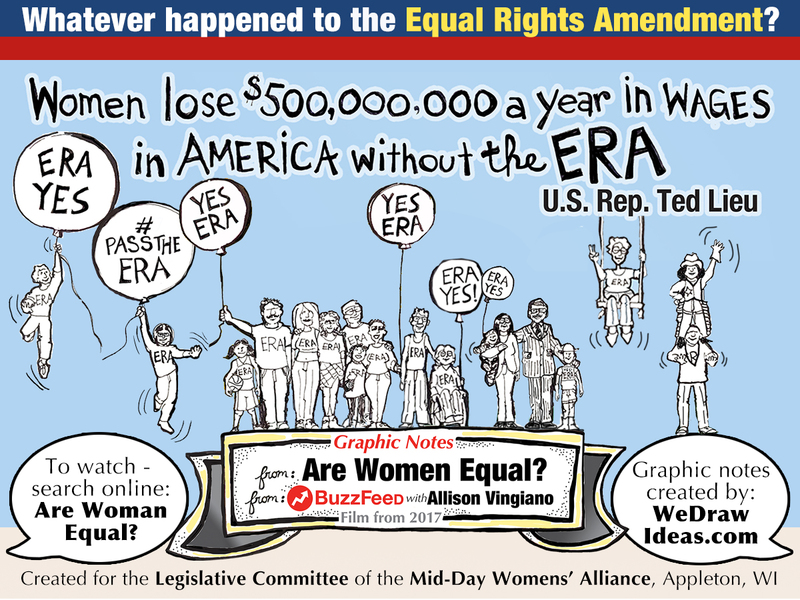 Topic: Whatever happened to the ERA? On February 20, 2019 Barb Luhring traveled to Appleton, Wisconsin on assignment for the Mid-Day Women’s Alliance. 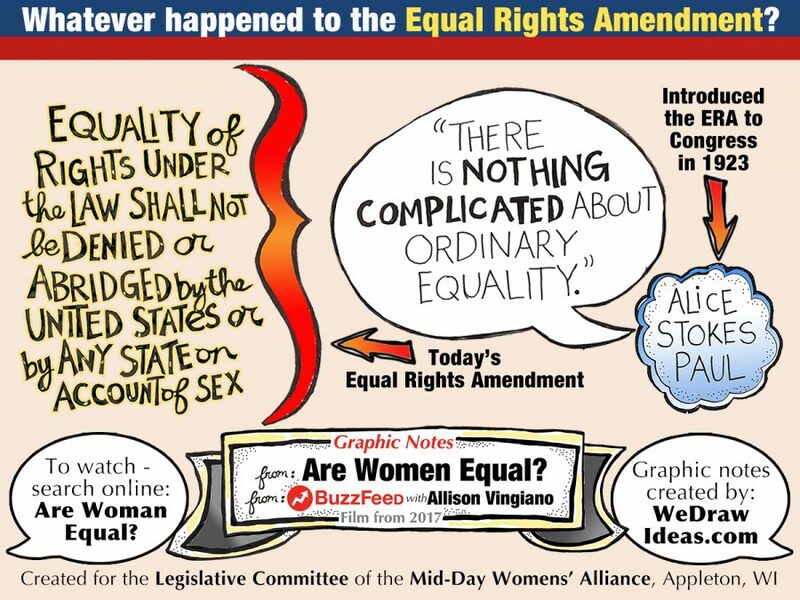 Women’s Alliance members Irene Strohbeen and Sandi Rohde gave a presentation on the status of the Equal Rights Amendment to interested members in attendance. 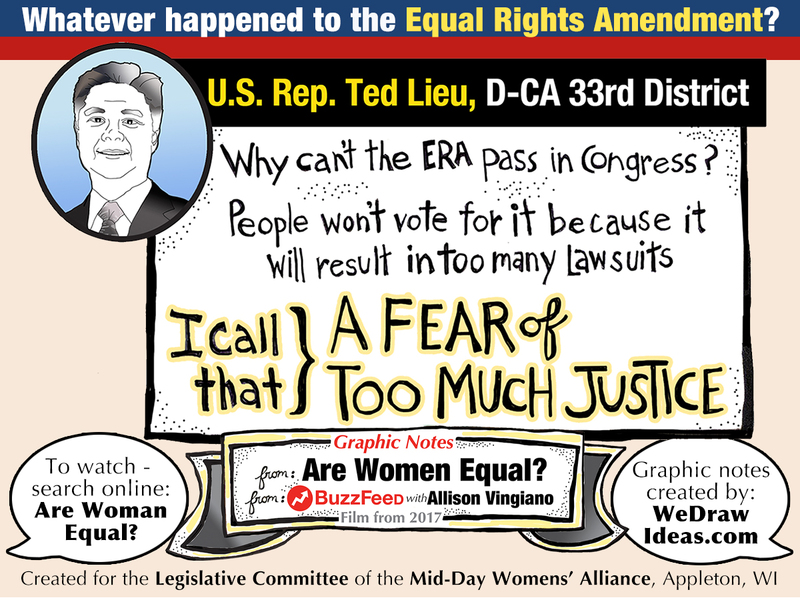 The title of the program was Personalizing the Equal Rights Amendment. The Case for Change. The highlight of the presentation was the short film Are Women Equal? (A BuzzFeed film by Ali Vingiano) that would be shown to the group, providing the spark for a conversation about the Equal Rights Amendment. 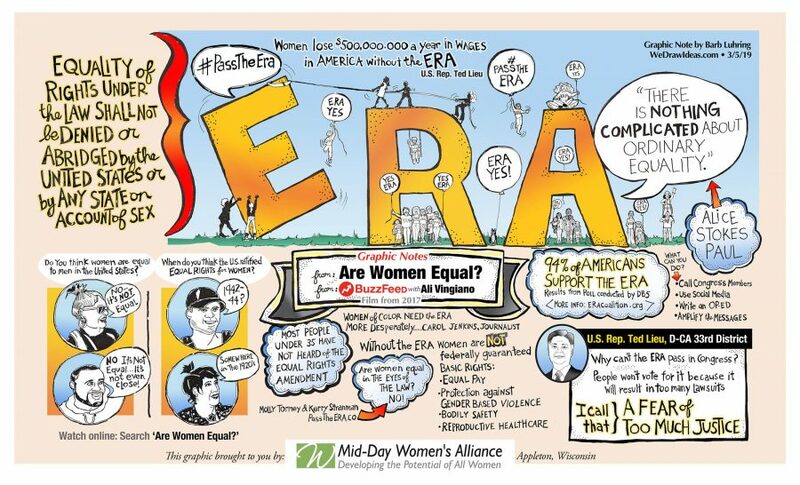 The discussion was complimented by Barb’s graphic recording (3’x 6′), which captured the film’s highlights via illustration and hung on display in the room during the event. The graphic recording reinforced the messages of the film and served to engage attendees, who shot photos and posed with colleagues in front of the image. What are clients saying about our work? 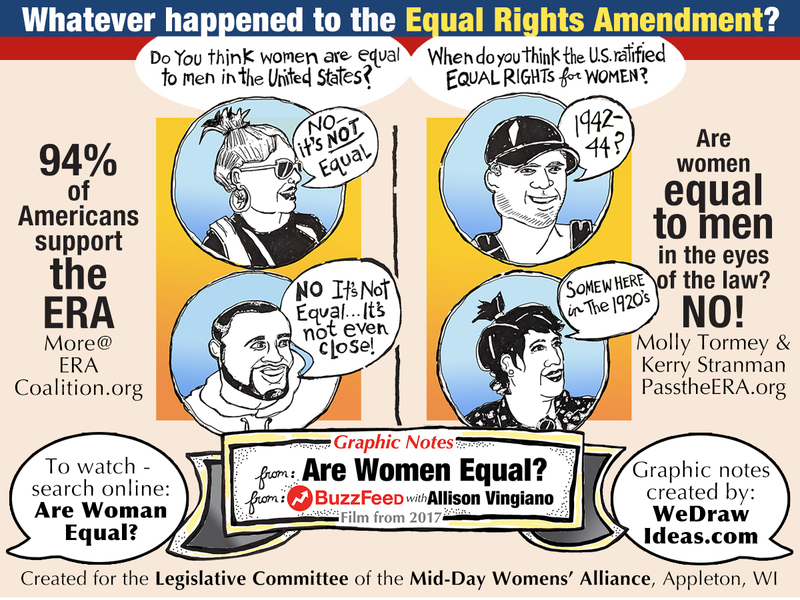 Barb’s drawing is a great graphic summary of the “Are Women Equal” video! We have been posting it and handing out copies—it’s a great reminder of the key points that were in the video, and we’ve been showing that video over and over. Everyone that has seen Barb’s poster has been impressed and excited about it! Thank you for your excellent work Barb! Order Additional Digital Assets from the retouched illustration – created after your event. Download and print as a PDF for in-person social sharing or distribute via email to friends, family and colleagues. Download and print as a PDFfor in-person social sharing or distribute via email to friends, family and colleagues. Download and share JPEGs for in-person social sharing or distribute via email to friends, family and colleagues. Creating the drawing: Since the event would take place within a 2 hour timeframe, Barb created the main drawing prior to the event and brought the completed work to the event. She brought an extra piece of paper to capture comments that took place during the discussion. Following the event, Barb created an 8.5″x 14″retouched PDF for easy sharing with Mid-Day Women’s Alliance who were not able to attend or who wanted to share with friends or colleagues. 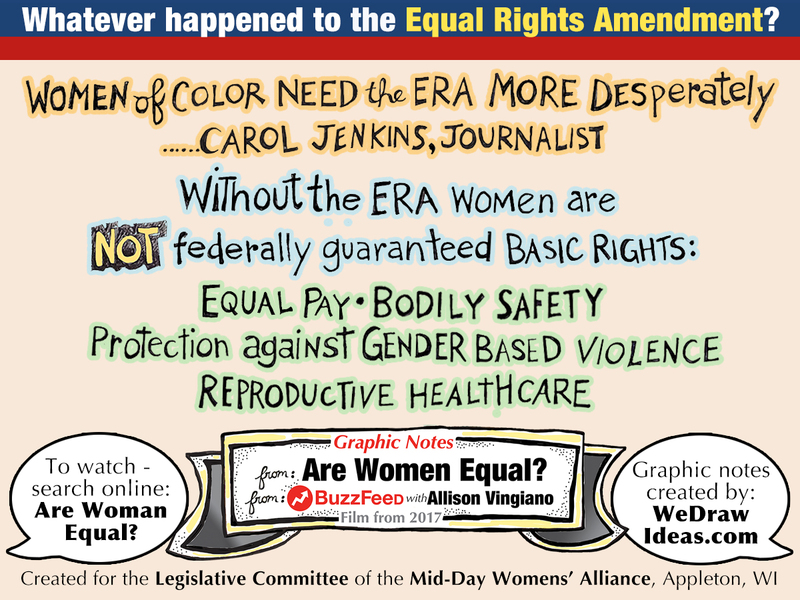 In addition, Barb also created sharable graphics highlighting important points from the film Are Women Equal? A) 3′ x 6′ graphic recording of a film about the ERA that visually summarized the film and hung on a wall onsite during the presentation. The drawing was completed in pastels and Sharpie black marker on 80lb white paper. B) 8.5″ x 14″ digitally retouched version of the larger drawing for sharing on social media and as color copies. C) Up to 10 Sharable highlight graphics from the drawing suitable for social media. Each graphic contains client identity and is a retouched digital piece of the original graphic recording. All work includes drawing materials and paper. Have a different budget and want to know what Barb can do for you?